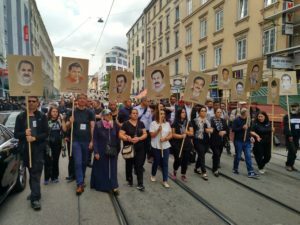 Speech by NSU Watch at the rally and march after the verdict in the first NSU trial on 11 July 2018. A string of right-wing attacks aiming to drive out parts of the population and restructure our society. 10 murders, three bomb attacks, 15 bank robberies committed by neo-Nazis. It’s about authorities who were not merely racist, but actively involved, and hence refused to intervene and stop the killing. And it still is about a society who didn’t listen to survivors or the victims’ families when they suggested Nazi involvement back in 2011. A society whose racism has nurtured the NSU. We’ve always worked to find out exactly what the NSU complex really is. We’ll keep doing that. Our anti-fascist initiative formed in 2012 to observe the trial and the entire investigation into the NSU complex, because back then already, we didn’t trust this first NSU trial. This trial pretended to investigate everything and solve everything – and to magically restore social harmony upon announcement of the verdict. We always knew that one big trial would not be enough reveal this huge complex. And today we still know very little about the NSU complex. No wonder, in a society that enabled the NSU by always looking the other way. Still, we tried drawing attention to this trial and to observe it. It was the right thing to do, and it matters. Despite all the cover-ups, the trial often shed light on the involvement of the state and society’s racism. That’s mainly due to the tireless effort of the accessory prosecution, the lawyers of the aggrieved families and individuals. The trial could have been much better. It could have started with the questions asked by the victims’ families and the survivors, instead of muting their demands and their stories. The senate did this deliberately, so now the families and survivors still can’t be sure whether the local accomplices of the NSU are their next-door neighbors. They still ask themselves – and so do we: Why did the authorities not intervene to stop the killing? Why are some still doing everything to hide the truth? When the trial had just started, a lot still seemed possible, but these questions were soon thrust aside. But we still feel them burning, and we won’t stop fighting for answers! Today we’ll also start looking ahead. We’ll leave this trial, this place which celebrated the killers all too often. The future belongs to the victims’ families and to the survivors, their questions, and their wishes. Once more, we’ve all had to realize how empty these truth-finding promises are and see our hopes for this trial disappointed. We have been and will continue seeking the truth on our own. Maybe we’ll never know everything about the NSU complex, but we’ll do our best to fill the gaps. Our case is not closed! Since the acronym “NSU” became shorthand for Nazi terrorism in 2011, we’ve seen society shift move to the right. This racist mass mobilization would have been impossible, had society reacted differently to the NSU complex. Instead, we’ve increased the budget for the secret police (Verfassungsschutz). Really dealing with the problem would require us to tackle the conditions that enabled the NSU. We can’t trust the government to do it. Yet, we should keep our eyes on the goal, because we are learning from the NSU complex. That’s why we repeat the demand voiced, among others, by Ibrahim Arslan, survivor of the racist arson attack in Mölln: The victims and their families should be seen as the main witnesses of the events. We don’t just want to sit and watch as society moves to the right. We want to stand up! Wherever racism, antisemitism, sexism, homophobia, or transphobia appear, we should speak up and fight back! We know how Nazi terrorism works and how big the threat really is. We’ll take our own findings more seriously and keep publishing research to uncover what happened and what they’re planning next. Let’s stop the fascists wherever we can! This also means we should never forget. We won’t forget that most of the key players of the NSU complex are walking free. But we have many sources telling us who these people are, and we’ll find out about others. We won’t forget what we’ve learned, seen, and heard since November 2011. We won’t let the killers’ empty words fool us! But most of all, we won’t forget the victims of the NSU and the survivors. We’ll think of them and we’ll remember those who died. That’s what we mean when we say: Case not closed!